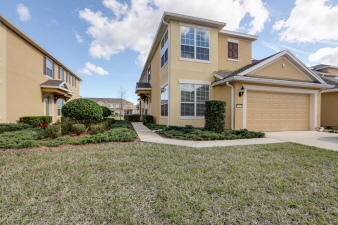 End townhome in Flagler Station! 3 Beds 2 Baths 1 Partial Bath 2,345 Sq. ft. Located in Jacksonville's Mandarin area in the gated community of Flagler Station this town home was built in 2012 and has been well cared for. The soaring ceiling showcases the living and dining rooms and the upstairs loft that all overlook the pond. One of the best features about this floor plan is the first floor owner's suite with garden tub and walk in closet! There are 2 bedrooms, a bathroom and 2 loft areas upstairs. The kitchen features granite counter tops, a center island, side by side refrigerator, flat surface range/oven, microwave and dishwasher. Flagler Station offers a pool & fitness area for residents. The HOA is $258 monthly. Come home to Flagler Station - you'll be glad you did! Stucco exterior, end unit with windows in kitchen, dining room & a triple sliding door in living room. The HOA maintains the roof and exterior of townhome. You will find lots of cabinetry, storage areas and closets, a 2 car garage and an inside laundry room (washer and dryer can stay).